Purchase select quantities of Tandberg Data Cartridges and get: (1) USB Internal 3.0 Docking Station for FREE! Now through March 15, 2019 while stocks last. RDX QuikStor combines the portability and reliability of tape-based backup with the speed and simplicity of a hard drive. 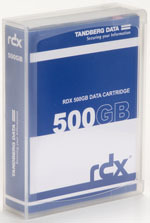 Compact internal or external drives accept pocket-sized RDX cartridges. Each cartridge is a rugged miniature hard disk—your computer will recognize it and provide instant access and easy drag-and-drop control. Write and read access is near-instant allowing users to work directly with the data on the cartridge like one would with any other hard disk drive. With capacities of 500GB, 1TB, 2TB 3TB, 4TB or 5TB on a hard disk cartridge, or 64, 128, 256 or 512GB on a solid-state disk cartridge, you have enough capacity to support a wide range of storage requirements, ensuring your data is fully protected. 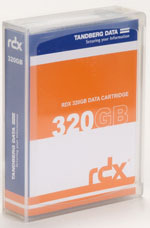 Tandberg Data RDX QuikStor 320GB - Removable Disk Cartridge Part # 8536-RDX 320GB Disk cartridges - available now at Backupworks.com visit our site or call an account rep today for all your RDX removable disk storage needs.